Congratulations on picking up the Filter Bar add on! You’re probably excited to unleash your new calendar filtering powers, so let’s go over the the ways you can configure the plugin to suit your needs. 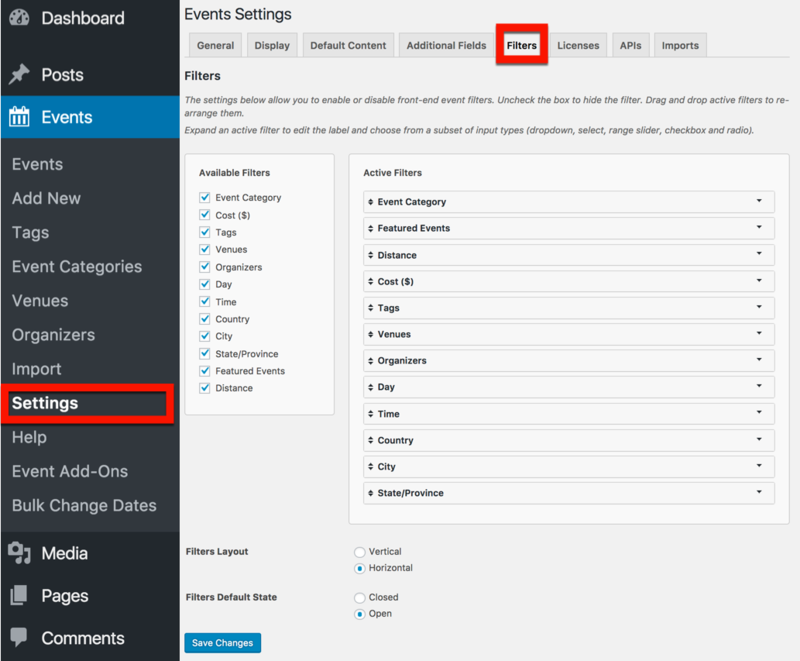 The first thing you’ll want to do is head over to the Filter Bar settings, which you can find under Events > Settings > Filter Bar in your WordPress admin. If you have Filter Bar and Events Calendar PRO, you'll also see one more available filter: Distance. This filter shows if a visitor uses the Location search on any calendar view. They can use the filter to narrow the initial search to a specific radius from the defined location. Check and unchecking filters in the Available Filters box has two effects. The first is that it will add or remove filters to the Active Filters box on the right. The second is that it will add or remove the options that visitors see on the front end of the website when viewing the filter bar on the calendar page. Note: The options available to site visitors using the Country, City, or State/Province filters are defined by your published venues. The filters only include data from published venues that are assigned to a past, present, or future event. The information from venues which are not associated with any published events will not be used in the filters. Now that you’ve chosen which filters to include, you can configure how they display on your website by arranging them in the Active Filters box. You can choose in what order the filters will display. Click and drag each item to the change their order. Next you can configure how each filter displays and behaves. Every filter in the Active Filters list can be expanded by clicking the down arrow to the right to reveal advanced options. For example, expanding the Cost ($) filter reveals options to change the display from a slider to checkboxes and whether to include free events in the filtered events. For more help with venue data, see Troubleshooting Map View. If you use Events Calendar PRO 4.0+, then you have the extra option of being able to add any Additional Fields you've created to the Filter Bar. Let's say, for example, you have a custom field for Dress Attire. That custom field will be available in the list of configurable options for Filter Bar, allowing you to display and customize the appearance of that field in the Filter Bar. Notice the extra option to configure the Logic for this filter. This allows you to set a condition that filters events based on whether an event meets all the criteria of a user's selection or any part of it. For example, if we had an event that was offered both Black Tie and Casual options for Dress Attire, then we could tell the Filter Bar to show all events related to either option, or both of them. Note that even if you add a PRO Additional Field to Filter Bar's settings, this Additional Field will not appear on the front-end unless at least one of your events has a value set for this particular Additional Field. By default, Filter Bar is displayed as a horizontal bar across the top of your calendar. 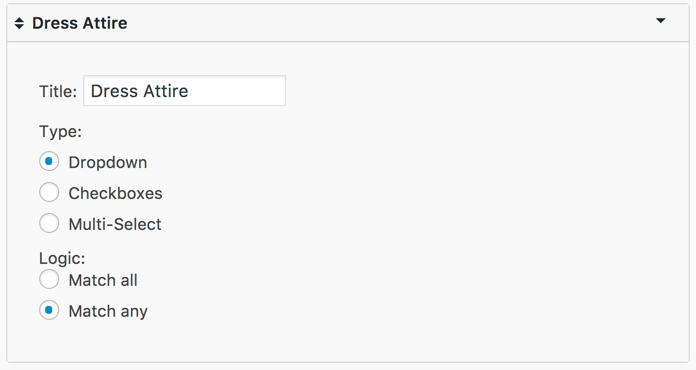 By default, the Filter Bar will be open to reveal the filter options on the front end. If you prefer to hide the filtering options by default, you can select “Closed” in the Filters Default State option. This will collapse the filter bar and display a “Show Filters” link instead which, when clicked, will expand filter bar to display the available filters to visitors. It's worth noting that mobile view follows slightly different rules. There, the filters will always be closed by default, irrespective of the above setting. When configuring your Filter Bar settings, it’s important to remember to save your work by clicking the Save Changes button. It’s easy to forget, but a necessary step to ensure that all your hard work is saved and works.